In heavily infected clams, Perkinsus olseni (= P. atlanticus) frequently induces the formation of white or light brown nodules on the gills, foot (picture 1), gut, digestive gland, kidney, gonad and mantle. The sometimes massive aggregation of Perkinsus cells and haemocytes form lesions that may interfere with respiration and other physiological processes such as reproduction (fertility/fecundity, when large lesions occur in the gonads), growth and/or survival and thus have an impact on fishery productivity. Infection in Ruditapes decussatus has been associated with extensive mortalities in clam breeding areas located on the south coast of Portugal. Picture 1: Muscle tissue from the foot of Ruditapes philippinarum infected by trophozoites of Perkinsus olseni. Note the haemocytes surrounding the parasites (H&E staining). Perkinsus olseni is a pathogenic dinoflagellate of different species of clams in Europe. The standard diagnostic technique for Perkinsus sp. diagnosis in molluscs is the culture of host tissue (usually gills) in the “Ray’s Fluid Thioglycolate Medium” ( RFTM). This technique has been adapted for Perkinsus olseni diagnosis in whole clams (Almeida M., Berthe F. et al. 1999). 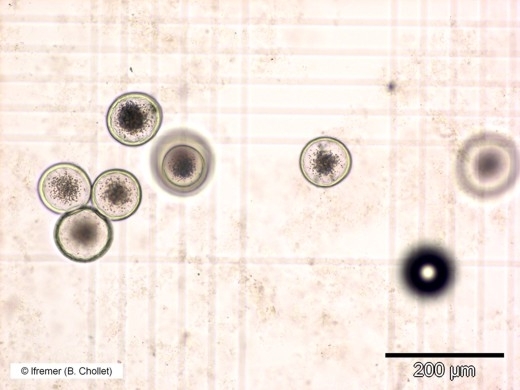 The biggest limitation of the technique is the time it needs to get hypnospores (picture 2) that can be visualised after staining by Lugol’s iodine (usually between 5 and 7 days of incubation in RFTM). Picture 2 : Hypnospores of Perkinsus olseni isolated from Ruditapes philippinarum gill and cultivated on RFTM after NaOH digestion of host tissue. Histology can be used as a screening technique (see picture 1). Trophozoites are often large (up to 40 µm) and can easily be visualised by histology. 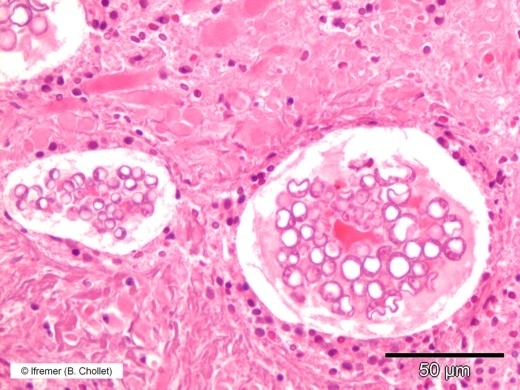 In most clams, infection is usually associated with an infiltration of numerous haemocytes into the surrounding tissues. Encapsulation and phagocytosis is common. A species specific PCR technique based on the amplification of part of the rRNA non transcribed spacer (NTS) region has been developed (Robledo J. A., Coss C. A. et al. 2000). Forward sequence (PA690F): 5’ ATG CTA TGG TTG GTT GCG GAC C 3’. Reverse sequence (PA690R): 5’ GTA GCA AGC CGT AGA ACA GC 3’. Expected amplicon of 690-bp. Specificity: PCR tested with P. marinus DNA extracted from Crassostrea virginica and Perkinsus sp. DNA extracted from Macoma balthica is negative. Sensitivity: lowest limit of detection of P. olseni isolated DNA is 0,01 µmol of NTS DNA. A pair of primers has also been designed from the intergenic spacer (ITS) sequence between the 5S and the 18S rRNA to produce a PCR-based diagnostic test (de la Herran R., Garrido-Ramos M. A. et al. 2000). Forward sequence (PK1): 5’ ACC AGT CAC CAC AGG GCG TAA T 3’. Reverse sequence (PK2): 5’ GTA GCG TGC TCT GAT GAT CAC T 3’. Expected amplicon of 554 bp. Tested with P. olseni extracted from infected Ruditapes decussatus. A DNA probe that targets the LSU of the rRNA gene of Perkinsus olseni has been recently developed (Moss et al. 2006). Sensitivity is greater than histology but the probe has not been compared with the RFTM technique. Sequencing of the NTS can also be used to assess the species of Perkinsus observed in clams particularly when found in new host species (Murrell A., Kleeman S. N. et al. 2002). The first PCR technique has only been validated against P. marinus and Perkinsus sp. from Macoma balthica. Specificity and sensitivity: the technique amplifies only DNA from P. olseni and can detect 0.01 amol of cloned P. olseni NTS DNA in the presence of 1 µg of clam DNA. The second PCR technique has not been validated. Sequencing is too costly to be routinely used in diagnosis but can be used to confirm the species. White nodules can be observed on the surface of the mantle, digestive gland and gill tissues of highly infected clams. In case of suspicion of perkinsosis due to Perkinsus olseni, gills are placed in Ray’s Fluid Thioglycolate Medium for 5 to 7 days. In parallel a piece of gills should be fixed in ethanol for molecular analysis (PCR/ sequencing). Perkinsosis due to Perkinsus olseni is listed by the OIE Code (2009 version) and the Manual of Diagnostic Tests for Aquatic Animals (2009 version). It is advised to follow the recommendations of the OIE. Almeida M., Berthe F., et al. (1999). Whole clam culture as a quantitative diagnostic procedure of Perkinsus atlanticus (Apicomplexa, Perkinsea) in clams Ruditapes decussatus. Aquaculture 177(1-4): 325-332.
de la Herran R., Garrido-Ramos M. A., et al. (2000). Molecular characterization of the ribosomal RNA gene region of Perkinsus atlanticus: its use in phylogenetic analysis and as a target for a molecular diagnosis. Parasitology 120(4): 345-53. Moss J.A., Burreson E.M. & Reece K.S. (2006). Advanced Perkinsus marinus infections in Crassostrea ariakensis maintained under laboratory conditions. J. Shellfish Res., 25: 65–72. Murrell A., Kleeman S. N., et al. (2002). Synonomy of Perkinsus olseni Lester Davis, 1981 and Perkinsus atlanticus Azevedo, 1989 and an update on the phylogenetic position of the genus Perkinsus. Bulletin of the European Association of Fish Pathologists 22(4): 258-265. Robledo J. A., Coss C. A., et al. (2000). Characterization of the ribosomal RNA locus of Perkinsus atlanticus and development of a polymerase chain reaction-based diagnostic assay. J. Parasitol 86(5): 972-8.